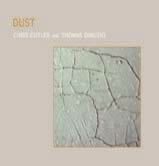 The second Cutler/Dimuzio collaborative album is a true masterpiece which takes the intriguing premise of Quake to a wholly unprecedented new level. Using only Cutler's electric drum kit, some electronics and a sampler (used to process Cutler's drums in real time as well as an instrument in its own right), the two musicians conjure one of those rare albums that sails through caverns measureless to man. Although nominally divided into 19 tracks, the album consists of two long improvisations, one live in New Mexico and the other a studio piece recorded in France. Requiem is the live improvisation that takes up the first half of the album, tracks 1 - 6. This picks up where Quake left off, and the result is utterly beguiling; it's almost impossible to discern any of the normal features of music - melody, rhythm or even recognisable instrumental sounds - but it's a piece that grabs the attention and doesn't let go. The two performers establish a remarkable tension that persists for the duration of the piece, never resolved but contantly evolving. For an abstract piece of electronica it's also unexpectedly moving, and it serves as a remarkable requiem (although to who or what it is dedicated is unclear). For most of the piece there are no readily identifiable drum sounds, and even when they do emerge they are not played in a conventionally rhythmic style. As much as they are musicians, Cutler and Dimuzio are careful and attentive listeners: to the world around them, to their immediate environment and to each other. The results of their painstaking approach reach their zenith on this 21 minute piece, which reveals more of itself on every listening. The second half of the album, Universal Decoding Machine, is the result of a very different process. This was recorded in a studio in France, with EM Thomas wandering around outside with a binaural microphone feeding in natural sounds to be treated, and engineer Bob Drake modifying the sound at the mixing desk. The piece was subsequently treated and reassembled post production by Dimuzio, creating an interesting contrast with the sponatnaeity and intimacy of the first half. Cutler's drums are sometimes clearly audible, and he even strikes up a relatively conventional backbeat on track 13, which is actually quite shocking when first heard. The sounds of birdsong, flowing water and other natural sounds create a sense of space and light that is the mirror image of Requiem's feel of enclosed underground spaces.